As with many common household products today, baking powder is so ubiquitous that we hardly imagine someone needed to invent it. But Dr. Price did, and marketed it well, along with his famous Delicious Flavoring Extracts. A more detailed story of the inventor of baking powder is available in the book published by his great grand daughter Victoria Price, daughter of actor Vincent Price. Cover of Dr Price’s Delicious Desserts Cookbook,1904. Full text available at the Duke University Library website. i have a framed original ad for Dr. Prices Vanilla Extract with a picture of a blond girl holding a plate of divinty. Any interest? My husband works with asphalt and concrete. 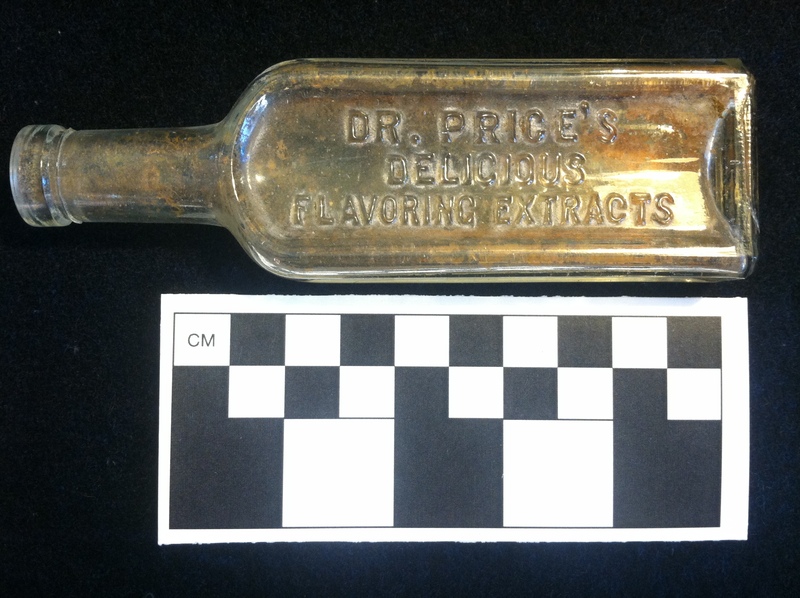 In a dig today, he found 3 miniature bottles, 1 was Dr. Price’s Delicious Flavoring Extract. This was in Oak Brook Terrace, IL. This is gold to me. I collect miniature perfume bottles. I have a booklet dated copyright 1917 by Price flavoring . I have a bottle (brown) with PRICE embossed near the neck of the bottle and DES PAT 128402 on the bottom. Can you tell me anything about it? Thanks for reading. I don’t have any more information about that specific bottle than what I have already described here. Good luck in your research. I just found one in a creek in St. Louis, Mo. I knew the story of Vincent Price’s grandfather after reading the biography by his daughter. I’m a huge fan of Vincent Price, and I knew he grew up in St. Louis. I picked it up wondering if there was a connection to the pharmacist Dr. Price. I’m so glad that I kept it knowing that it came from that business. The only thing is it has a screw top instead of a top for corks. It also says on the bottle “Patent appl’d. for under the Flavoring Extracts. Can you tell that this may be a later version of the bottle? Hello! I can’t say for certain, but my guess is that you are correct. After screw top bottles were introduced, cork top bottles were phased out of production. Thanks for reading! I’ve had a bottle (cork stopper type) in my window for about 3 decades. Nice to hear the backstory! Found this bottle today on a sandbar in perfect condition. At LEAST A HUNDRED THIRTY FOUR YEARS OLD. I found one exactly like the one in the picture in mint condition in my yard in Jackson,TN. I have a small crate marked Corena Yeast manufactured only by Price Flavoring Extract Company, but can’t find anything about Corena Yeast . Hi, Here is a painting illustrating an advertisement for Price Flavoring. I would like to know the name of the illustrator on the lower right and the date. It may be an artist’s copy of the original because it seems to read O….. Parr ’56 It’s very well done. Thanks for reading! I’m sorry, but I don’t have any information on that item. You could try more internet research or ask around at antique stores or auction houses. Good luck! I found 1 of these bottles and I’m trying to find out what it’s worth . The R in doctor is smaller then the D and it has the numbers 12 – 7- 6. ON The bottom of the bottle . I hope to hear back from someone who might be able to help me with this . Thank you.